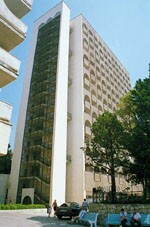 Sanatorium "Ah-petri" is located in the centre of a resort zone of park Mishor, on to seacoast. Two arranged well cases are calculated on 750 persons. The medical beach with an original shadow zone was stretched on 400 m. Near to sanatorium there is a rope-way to Crimean mountains the Ah-Petrinsky ridge and wonderful, world famous Alupkinsky park with dvortsovo-park ensemble (the Vorontsovsky palace). Distance to Yalta-15 km. The sanatorium specialises on treatment of respiratory organs of not tubercular character (a bronchial asthma, a bronchitis, a pneumonia, diseases of the top respiratory ways), cardiovascular and nevrogennye diseases. 2-seater lux (2 rooms) - 18 pieces of Number with all conveniences, the TV, a refrigerator, phone. 3-seater lux (3 rooms) - 6 pieces of Number with all conveniences, the TV, a refrigerator, phone. 2-seater number (1 room) - 400 pieces In number all conveniences, a refrigerator, the TV. The bar, restaurant, a sauna Works, are opened a hairdressing salon, prodtovarnye and manufactured goods stores, a call box of long-distance automatic telephone exchange; walks on motor and veselnyh boats. Excursions to Sevastopol, Bakhchisarai, Chersonese. In the winter - skiing on a plateau "Ah-petri". The Tennis court, an athletic field, billiard, water bicycles, a water ski. Ingaljatory, a hall of physiotherapy exercises with training apparatus. Special offices: (fizio - and laser therapies, stomatology and prosthetics, massage, reflekso - and herbal medicines, cosmetology. a massage Office, ingaljatory, balneotherapy, electrotreatment, correction of sight, physiotherapy exercises hall, the psychotherapist, inhalations, a hydromassage office. the Cinema, billiards, a bar, a dance pavilion, restaurant, library, booking of tickets, the international call box, a hairdressing salon, hire of water skis, sledge, surfing, connection of numbers to the satellite aerial, shop.
" rest in Crimea without СЏСЋС‘РЃС…С„СЌС€СЉСЋС‚".